JKB is a new laboratory in Toin Univ. of Yokohama from April 2013. In the near future, Health, Beauty and the Information technology will become a very important topic in the world. Signpost to this keyword, we will expand the study in originality and creativity. Then, we will give a concrete shape to our ideas. It's Japanese "MONODUKURI" and the heart of "OMOTENASHI". in addition, this is THE JKB MIND. We have many grand dreams to contribute to the people of the world by our research activities. Please feel free to drop in anytime. Enter from the Bus Stop "Toin Gakuen mae" and turn left. 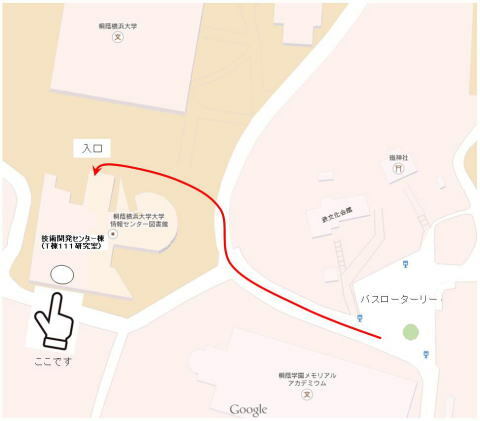 Keep going straight until reaching circular building. Entrance of our building is the light-back of the library.